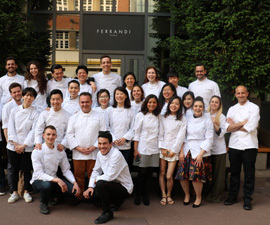 FERRANDI Paris is now offering interested candidates the opportunity to optimize their culinary training by combining programs and disciplines ! a comprehensive experience from beginner to advanced level, to ensure that you are ready to jump into the industry, in an existing business or in your own. They also make sense financially with a 5% discount on tuition ! Becoming an accomplished chef or running a food-related business requires a comprehensive skill set. Combine French Cuisine and French Pastry to boost your employability and open a multitude of opportunities ! Or if baking is your passion, combine French Pastry and French Bread Baking to launch your dream business ! French is also taught to those who obtain below a B2 level. Mastering the fine art of French Cuisine or French Pastry is a long-term project. Prepare yourself for your new career by choosing a 12 month experience focused on the field you are passionate about. Admissions and How to apply ? Please call : +33 1 49 54 17 67 or email in advance and we would be pleased to show you around.